Yemeni people have a full right to resist “Saudi aggression” and a planned occupation by “all means and options,” the Houthi rebel leader said, as Riyadh wraps-up the “first phase” of an operation that saw more than 2,300 airstrikes in less than a month. “It’s the right of our people to resist the aggression and face the aggressor by any means,” the leader of Yemen’s Houthi militia Abdel-Malek al-Houthi said in a televised speech. Saudi Arabia’s goal is the “invasion” and “occupation” of Yemen, in order to “place this country again under its feet and hegemony,” al-Houthi said as the Saudi-led airstrike campaign entered its 26th day. “Our Yemeni people will never give in – it will resist in the face of the savage aggression,” the rebel leader concluded, stressing that Saudi Arabia “has no right to interfere” in its neighbor affairs. He also stated that Iran, which some accuse of supporting the rebels, actually has “no influence” in the country. “The political problem is an internal affair and it is up to us to define our future,” he said. At the same time, the rebel leader condemned the “unfair” UN Security Council resolution passed earlier this week which endorsed an arms embargo on the Houthis and their supporters. The intensifying inter-tribal clashes and airstrikes in Yemen took the lives of at least 85 people on Sunday, medical and military sources told AFP. In the city of Daleh, 31 Houthis and 17 pro-Hadi forces were killed a local official said, confirming a series of air strikes on rebel positions in the region. At least 10 Houthis died in the city of Taez during fighting which also left four pro-Hadi men dead, medics said. The country’s third largest city has seen intense fighting over the last week. 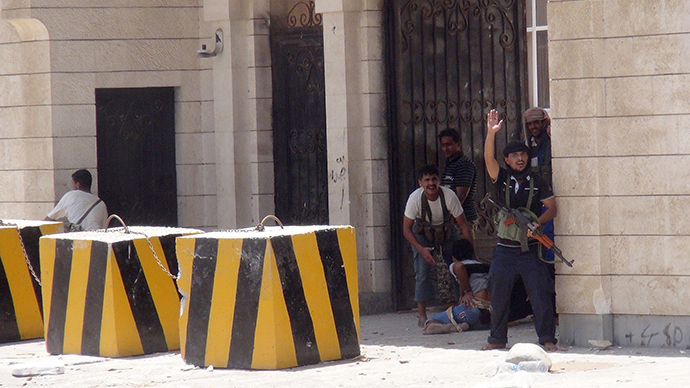 Other casualties were reported in the southern province of Shabwa, and in Aden. As part of the ongoing operation Decisive Storm, Saudis carried out more than 106 strikes on Saturday and Sunday alone, knocking out the central communication command of the Houthis, Saudi Brigadier General Ahmed Asiri told the Al Arabiya television channel. Through more than 2,300 strikes to date, the Saudi-led coalition has destroyed majority of the Houthi’s weapons storage facilities, he claimed. “Since the beginning of the military operation, 80 percent of the weapon storage facilities that were captured by Houthis have been destroyed,” Saudi Brigadier General Ahmed Asiri told the Al Arabiya television channel. Giving no comments on possible civilian victims of such massive air campaign, the General claimed Houthis were turning “houses, farms and caves” into storage depots and military operation command centers. With 18 out of 22 governorates in the country affected by the coalition’s airstrikes, the UN estimates that up to 150,000 people have now been displaced in the country. More than 750 civilians have been killed in intensified violence since the airstrikes began over three weeks ago. “Ordinary families are struggling to access healthcare, water, food and fuel – basic requirements for their survival,” UN Humanitarian Coordinator Johannes Van Der Klaauw said on Sunday. With “tangible results” reached on the ground, the “first phase” of the operation against Yemen has “almost” been concluded, General Asiri told al-Arabiya. But in the meantime over 15,000 Saudi troops are fortifying border positions against possible Houthi attacks, with some analysts alleging an ground invasion in Yemen would imminently follow. The Shia Houthi rebels took control of Yemen’s capital last year, forcing President Abd-Rabbu Mansour Hadi to flee Sanaa and then escape to Saudi Arabia. The Saudis accuse its main geopolitical rival, the Shia powerhouse Iran, of arming the Houthis – claims vigorously denied by Tehran.